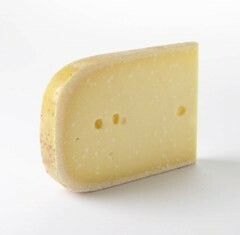 A nutty and creamy farmhouse Gouda made with raw milk and matured on the farm for at least two years. Our Aged Gouda is made by cheesemaker Wim Verway, on his farm just outside Ijsseltein near Utrecht in the Netherlands using milk from his small herd of Holstein cows. Gouda is a washed curd cheese and the curds and whey undergo a very specific process. Once the curd is set, a third of the whey is drained and replaced with hot water which has the effect of shrinking the curds pieces to produce a sweeter final product. The cheeses are brined for up to 3 days, which has a firming effect on the rind, and then coated in a water permeable plastic skin. The cheeses selected for Paxton & Whitfiield are matured for at least 2.5 years. The flavour and texture of this traditional farmhouse cheese is a far cry from the mass prodcued factory cheese normally associated with the name Gouda. It shows well developed cystallisation as a result of the maturation period, giving the cheese a lovely crunch, however it is not too firm, but creamy with delicious sweet, nutty tones.